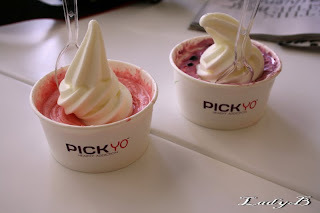 This weekend I managed to meet up with Pick & Pick Yo friendly owner, who took upon himself explaining the whole concept to be honest I'm a sucker for fro yo and since it opened in Kaifan Co-op I almost visit it everyday. This time I visited the K-City Branch , the owner kindly offered samples of the best selling yougurt flavours: White melon, cherry, watermelon & oh my berry ( a mixture of raspberry and blackberry as featured above) those flavours are based on fruits buree' mixed with original flavour of frozen yougurt. My favourites were, yellow melon & the cherry flavour very yummy and different than anything I tasted before I really loved the chunks of fruits in every spoonful. Many thanks to the owner for his kind hospitality we sure enjoyed ourselves and overdosed on fro-yo ! Thank you so much for your great review about PICK YO. It was my pleasure meeting you and introducing the concept of PICK and PICK YO. Glad that you liked what you tried. 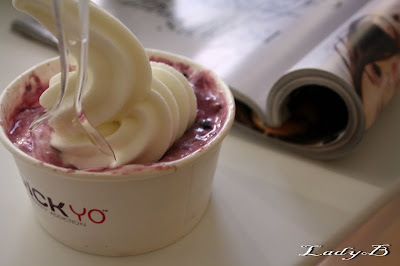 I think frozen yogurt is gonna replace juice in Kuwait big time!